Compact Adaptive Optics Retinal Imager (CAORI) | PSI - Physical Sciences Inc.
PSI introduces a new compact, multi-modal, high-resolution, adaptive- optics, retinal imager. 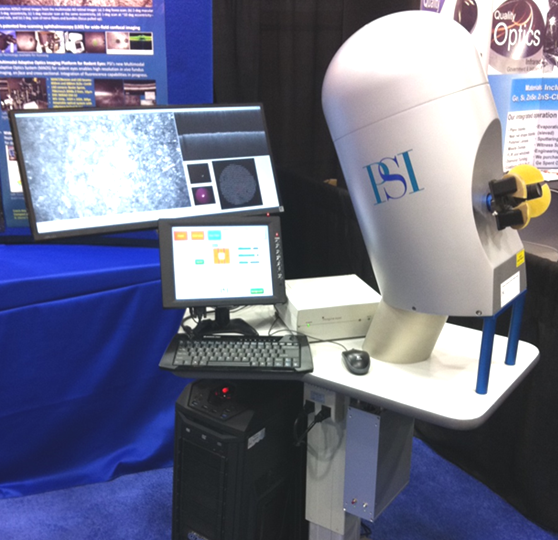 This powerful imaging platform is designed for fast, cone-photoreceptor density mapping and precise imaging of other retinal structures (e.g., Retinal Nerve Fiber Layer, retinal vessels and capillaries, etc.). The instrument combines the resolving power of Adaptive Optics (AO) with PSI’s line-scanning ophthalmoscope (LSO) technology in a foot-print suitable for clinical operation [US Patent 8,201,943]. A nominal field of ~3 x 5 degrees with HD-equivalent resolution @ >60fps enables retinal layers to be explored and efficiently mapped while maintaining 1μm/pixel sampling. CAORI is equipped with an Optical Coherence Tomography (OCT) channel, which provides a complementary cross-sectional retinal image for AOLSO guidance.